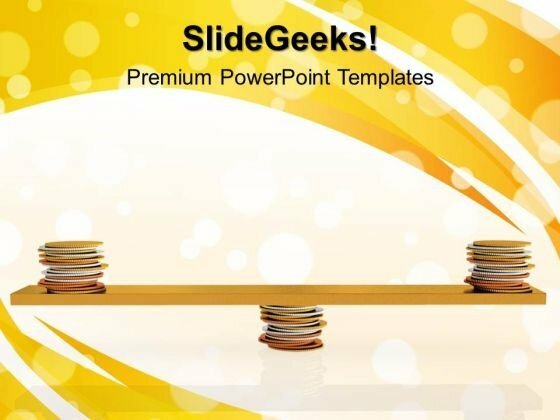 Coins Balanced On Seesaw Metaphor PowerPoint Templates And PowerPoint Themes 1012-This awesome PowerPoint template consists of an image of stack of coins lying and balanced on seesaw. This image represents the concept of financial stability. It signifies balance, cash, coin and money. Our awesome image makes your presentations simpler and professional showing that you care about even the smallest details. Create captivating presentations to deliver comparative and weighted arguments.-Coins Balanced On Seesaw Metaphor PowerPoint Templates And PowerPoint Themes 1012-This PowerPoint template can be used for presentations relating to-"Coins balanced on seesaw, money, finance, success, business, marketing" Confirm to them that you are the expert. Our Coins Balanced On Seesaw Metaphor PowerPoint Templates And PowerPoint Themes 1012 will affirm your thoughts. Be a change agent with our Coins Balanced On Seesaw Metaphor PowerPoint Templates And PowerPoint Themes 1012. They will make you look good.